Susan Szabo’s skilled use of colorful hues in watercolors and acrylics has become her trademark as an artist. She is renowned for her ability to capture the essence of Hawaii’s nature, people, and pets in a palette of colors that expresses the spirit of her subjects. She is inspired by the power of the land, the ocean and the mountains, as well as the energy of Hawaii’s people and families. Susan is a member of the Hawaii Watercolor Society and has received numerous awards and professional recognitions. Susan was the cover artist for Hawaii’s 1998/99 phone directories. She won two Ka Palapala Po’okela Awards in 2001 for the popular children’s book, “A Beautiful Hawaiian Day”, written by singer, songwriter, Henry Kapono. She has been a feature artist for Hawaiian Airlines and Aloha Airlines. When not painting, Susan contributes to society through volunteerism, believing strongly in the importance of giving back. She designed and donated the cover for the CD, “Hawaii Sings for the Children”, a benefit for the foster children of Hawaii. 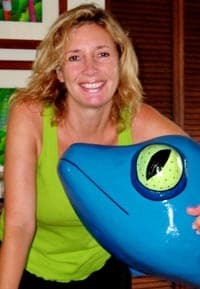 In 2004, Susan was chosen by American Savings Bank to paint a 6-foot fiberglass gecko as part of the Geckos in Paradise fundraiser for Kapiolani Women’s Health Center. Susan is an active supporter of Family Programs Hawaii as well as many other local charities. In 2007, she was commissioned to paint a 32-foot acrylic installation for Kailua Town, Oahu. Susan has an enthusiastic following and her original paintings, limited-edition gicleé prints and commissions are included in collections around the world. 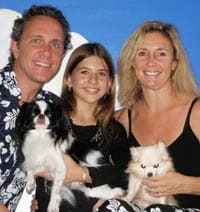 Originally from Toronto, she lives in Kailua on the island of Oahu, with her husband Steve, daughter Kira, and their dogs Ipo and Malia.